The final Hello GoodBye Show of the current season features live music from Spaceheads and Parvaz Ensemble. NB* The deXter Bentley Hello GoodBye Show will return to air on Resonance FM at midday on Saturday 13th September 2014. Spaceheads are a duo of trumpet and drums, based in Manchester and London. They formed in the early 1990s and have released nine albums to date as well as toured extensively around Europe and the USA. Parvaz Ensemble is a cross-cultural ensemble founded in 2001 by Arash Moradi and Fariborz Kiani. The music is predominantly inspired by the Tanbour Maqam music from the Kurdish region of Iran as well as the classical Persian music repertoire known as “Radeef”. 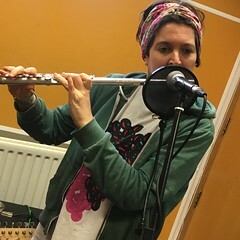 This entry was posted in dexter bentley, hello goodbye show, Hello GoodBye Show: Listings Info, resonance fm and tagged dexter bentley, hello goodbye show, london, parvaz ensemble, radio, resonance fm, spaceheads. Bookmark the permalink. Poo bum smell pat pants!